​Volunteers spent the afternoon planting several variety of bushes including Serviceberry / Highbush Cranberry (viburnum trilobum) as part of Wildlife Habitat Management. The edible fruit produced can attract and provide food for a variety of wildlife. Work on the final phase of thinning the wildlife habitat has ended. The holes needed to set the 30 ft. poles for the 2 Kestrel Hawk boxes and the 1 bat box are completed and poles will be set as soon as a truck crane is available. The last phase of thinning (logging) the wildlife habitat will begin in mid January completing this phase of our Wildlife Habitat Management Plan. Work has started on thinning the wildlife habitat, please use caution while using the trails. The CS/VW invited Cub Pack 369 from Moultonbough to join sanctuary coordinator Sarah Norton in the cleaning and preparing of several birdhouses located on the sanctuary property in anticipation of the upcoming migration. What initially was to be an event on snowshoes turned out to be more of a hike due to the lack of snow. This did not however dull these scouts spirits. It turned out to be a beautiful day. 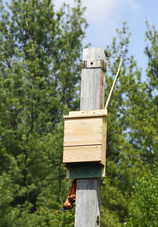 ​Each scout and some of the parents took turns cleaning each birdhouse, adding new shavings and spraying the poles with ammonia to prevent any hungry or curious critters from trying to build their homes or make a meal of the new occupants. The scouts were excited to discover that in a few of the houses mice had built nests, and were amazed that they could climb the poles to get in the houses. The scouts also enjoyed reading several of the information stations located along the trails such as what a logging bow and a stone culvert were. All in all it was a great day. The scouts earned their Community Service Badges, had a great time on the trails with their friends and families and even learned a few things along the way. We look forward to sharing many more outdoor experiences with these young adventurers. Photos on Calendar Page.